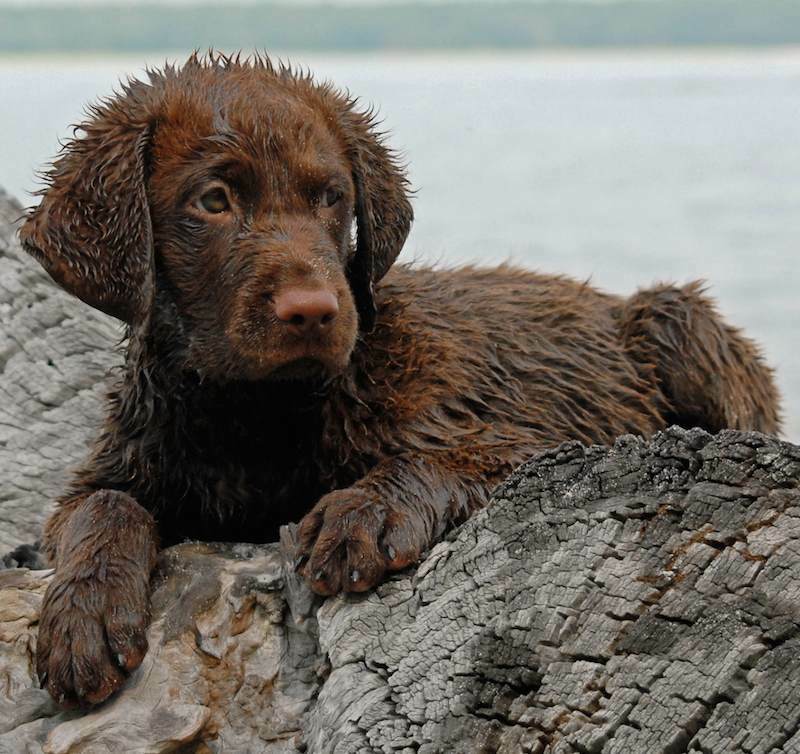 Chesapeake Bay Retriever (Chessie) was developed along the Chesapeake Bay to hunt waterfowl under the most adverse weather and water conditions. 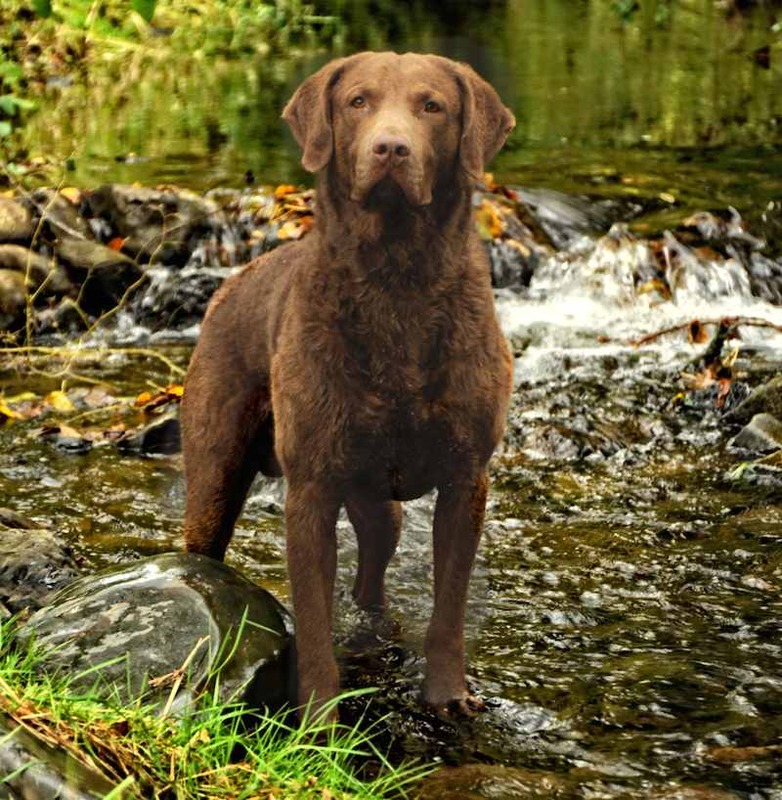 The Chesapeake Bay Retriever is equally proficient on land and in the water, often having to break ice during the course of many strenuous multiple retrieves. Frequently the Chesapeake must face wind, tide and long cold swims in its work. 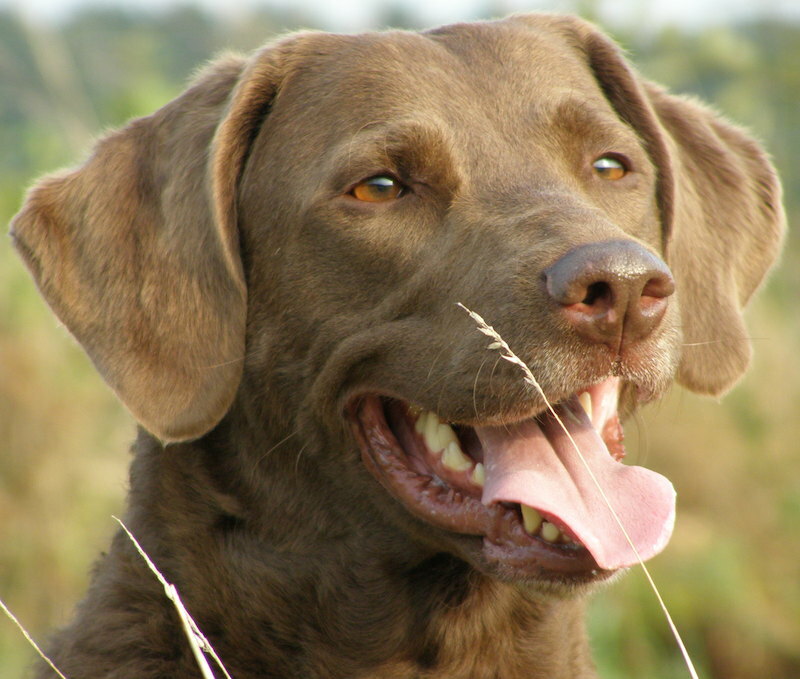 The breed’s characteristics are specifically suited to enable the Chesapeake Bay Retriever to function with ease, efficiency and endurance. The history of the Chesapeake Bay Retriever began in 1807 with the wreck of a British ship off the coast of Maryland. Among the survivors were two Newfoundland pups, a male named ‘Sailor’ and a female later named ‘Canton’ in honour of the American rescue ship. Both proved to be excellent water retrievers and were mated to local sporting dogs that may have included both Curly and Flat-coated Retrievers among others. The breed that emerged from this mixture proved to be excellent in cold and rough water. A powerful swimmer and an excellent duck retriever, the Chessie has always been valued for his talents rather than his appearance. General Appearance: The Chesapeake Bay Retriever’s skull is broad and round with a medium stop. The jaws should be of sufficient length and strength to carry large game birds with an easy, tender hold. The double coat consists of a short, harsh, wavy outer coat and a dense, fine, wooly undercoat containing an abundance of natural oil and is ideally suited for the icy rugged conditions of weather the Chesapeake often works in. In body, the Chesapeake is a strong, well balanced, powerfully built animal of moderate size and medium length in body and leg, deep and wide in chest, the shoulders built with full liberty of movement, and with no tendency to weakness in any feature, particularly the rear. The power though, should not be at the expense of agility or stamina. Size and substance should not be excessive as this is a working retriever of an active nature. The Chesapeake is valued for its bright and happy disposition, intelligence, quiet good sense, and affectionate protective nature. Extreme shyness or extreme aggressive tendencies are not desirable in the breed either as a gun dog or companion dog. 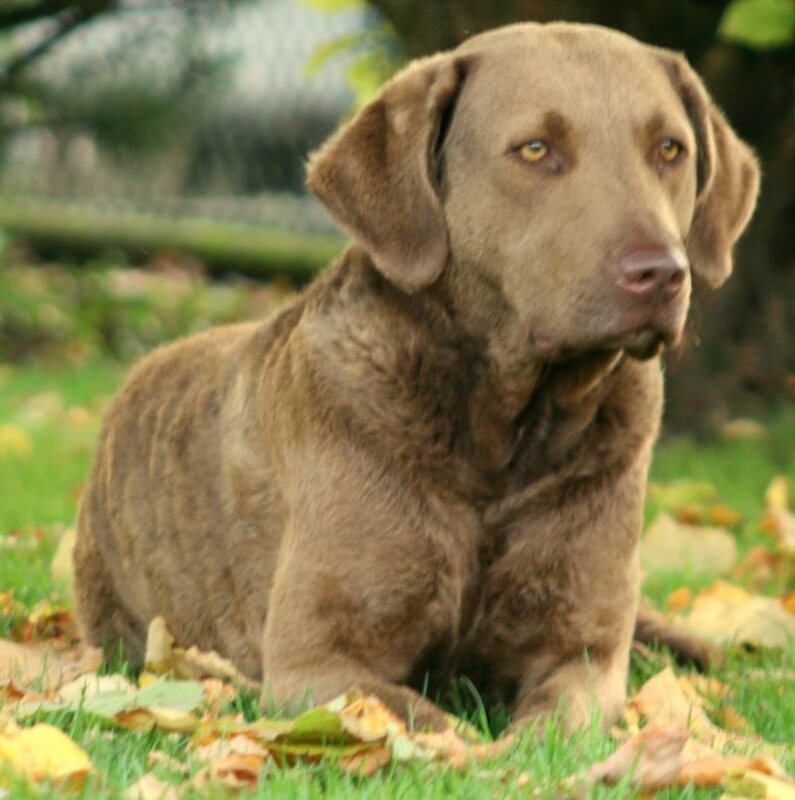 Chesapeake Bay Retriever Temperament: An ideal Chessie should show a bright and happy disposition with an intelligent expression. 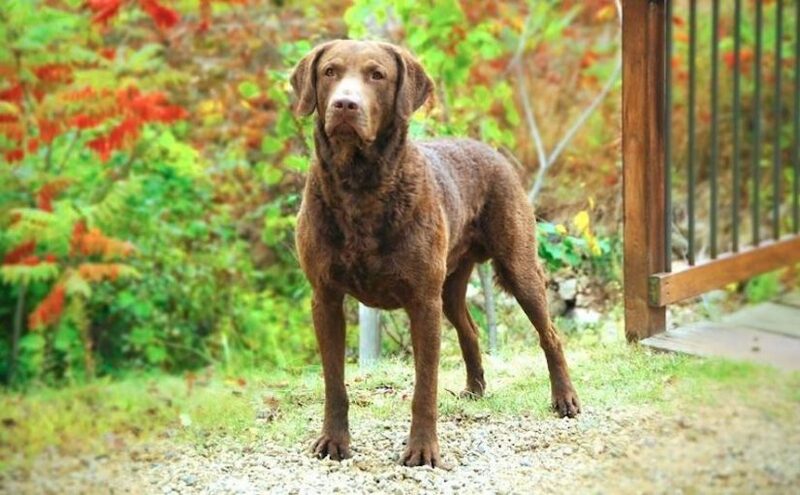 Courage, willingness to work, alertness, nose, intelligence, love of water, general quality and, most of all, disposition should be given primary consideration in the selection and breeding of the Chesapeake Bay Retriever. Size: Height: Males should measure 23 to 26 inches; (58-66 cm); females should measure 21 to 24 inches. (53-61 cm). Oversized or undersized animals are to be severely penalized. Proportion: Height from the top of the shoulder blades to the ground should be slightly less than the body length from the breastbone to the point of buttocks. Depth of body should extend at least to the elbow. Shoulder to elbow and elbow to ground should be equal. Weight – Males should weigh 65 to 80 pounds (29-36 kg); females should weigh 55 to 70 pounds (25-32 kg). Coat: Should be thick and short, nowhere over 1 1⁄2 inches long, with a dense fine woolly undercoat. Hair on the face and legs should be very short and straight with a tendency to wave on the shoulders, neck, back, and loins only. Moderate feathering on the rear of the hindquarters and tail is permissible. Colour: The colour of the Chesapeake Bay Retriever must be nearly that of its working surroundings as possible. Any colour of brown, sedge, or dead grass is acceptable, self-coloured Chesapeakes being preferred. (Self-colored: A single colour with or without lighter and darker shadings of the same colour.) One colour is not to be preferred over another. A white spot on the breast, belly, toes or back of feet (immediately above the large pad) is permissible, but the smaller the spot the better, solid coloured preferred. The colour of the coat and its texture must be given every consideration when judging on the bench or in the ring. Honorable scars are not to be penalized. Head: The Chesapeake Bay Retriever should have an intelligent expression. Eyes are to be medium-large, very clear, of yellowish or amber colour and wide apart. Ears are to be small, set well up on the head, hanging loosely, and of medium leather. Skull is broad and round with a medium stop. Nose is medium short. Muzzle is approximately the same length as the skull, tapered, pointed but not sharp. Lips are thin, not pendulous. Bite – Scissors is preferred, but a level bite is acceptable. Neck: Should be of medium length with a strong muscular appearance, tapering to the shoulders. Forequarters: There should be no tendency to weakness in the forequarters. Shoulders should be sloping with full liberty of action, plenty of power and without any restrictions of movement. Legs should be medium in length and straight, showing good bone and muscle. Pasterns slightly bent and of medium length. The front legs should appear straight when viewed from front or rear. Dewclaws on the forelegs may be removed. Well webbed hare feet should be of good size with toes well rounded and close. Body: Chest should be strong, deep and wide. Rib cage barrel round and deep. Body is of medium length, neither cobby nor roached, but rather approaching hollowness from underneath as the flanks should be well tucked up. The topline should show the hindquarters to be as high as or a trifle higher than the shoulders. Back should be short, well coupled and powerful. Hindquarters: Good hindquarters are essential. They should show fully as much power as the forequarters. There should be no tendency to weakness in the hindquarters. Hindquarters should be especially powerful to supply the driving power for swimming. Legs should be medium length and straight, showing good bone and muscle. Stifles should be well angulated. The distance from hock to ground should be of medium length. The hind legs should look straight when viewed from the front or rear. Dewclaws, if any, may be removed from the rear legs. Tail: Tail of medium length; medium heavy at base. The tail should be straight or slightly curved and should not curl over back or side kink. Gait: The gait should be smooth, free and effortless, giving the impression of great power and strength. When viewed from the side, there should be good reach with no restrictions of movement in front and plenty of drive in the rear, with good flexion of the stifle and hock joints. Coming at you, there should be no signs of elbows being out. When the Chesapeake is moving away from you, there should be no sign of cow-hock-ness from the rear. As speed increases, the feet tend to converge toward a center line of gravity. Disqualifications: Specimens lacking in breed characteristics ; Teeth overshot or undershot ; Coat curly or with a tendency to curl all over the body ; Feathering on the tail or legs over 1 3⁄4 inches (4.45cm) long ; Black coloured ; White on any part of the body except breast, belly, toes or back of feet.